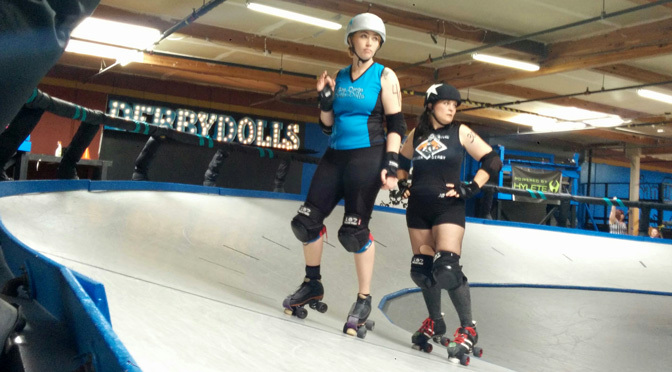 There are scant few roller derby banked tracks around the country, but that doesn’t mean there is scant interest in them. We here at Roller Derby Notes realized that there has been a heck of a lot of things happening in the banked track community lately, particularly this month, which may have national implications. From a small tournament in San Diego, to a big championship in Philly, to a potentially huge splash landing in Santa Monica, here is everything going on in the world of banked track roller derby that we know about, including the potential for a new banked track appearing in a town near you. 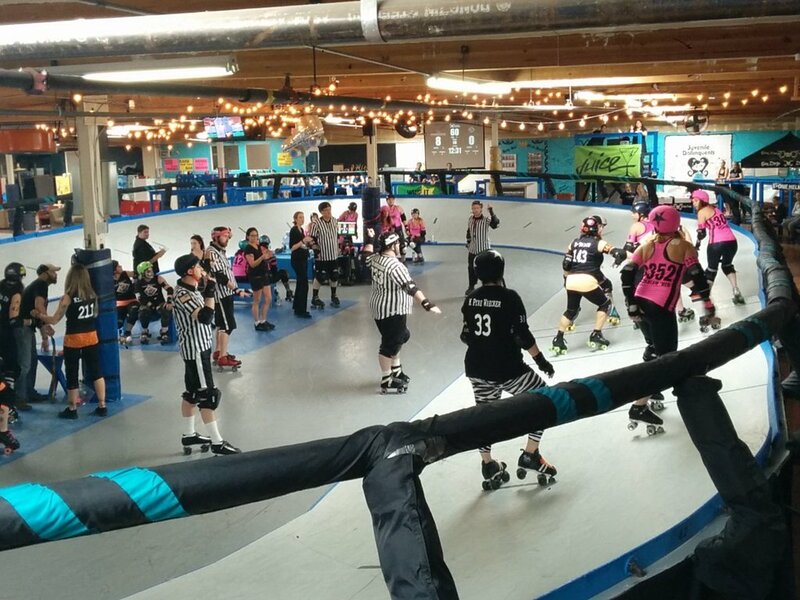 At the beginning of March, the San Diego Derby Dolls hosted Spring Fling, a one-day round-robin for four teams. Host San Diego fielded their B-team, the Sparks, while fellow RDCL member Penn-Jersey Roller Derby brought their A-team. Penn-Jersey also brought their A-game, going a perfect 3-0. One of those wins was against the South Side Derby Girls of Houston. South Side upset them last year at Battle on the Bank VIII in Seattle, winning 84-56 to send Penn-Jersey back to Philadelphia a lot earlier than most expected. The tables were turned in San Diego, where PJRD took a 83-37 win after a very tight-scoring first half. The fourth participant at Spring Fling was Deadly Rival Roller Derby of Florida, one of the newest members of the banked track family. They haven’t even had their track up for a year, and they’re already jumping into interleague play. To the surprise of absolutely no one, they went 0-3, the yin to Penn-Jersey’s yang. However, they had a ton of love and support from the banked track community. Deadly Rival’s performance reminded a lot of veterans about the maiden performances of teams new to the banked track, and how far they’ve come since those awkward first strides. Six years ago, Tilted Thunder of Seattle didn’t even have their track built, but that didn’t stop them from participating at Battle on the Bank III, also in San Diego. They too lost all of their games—badly. But just some years later, they’re an annual threat to podium. Penn-Jersey themselves can relate to Deadly Rival’s plight. Their first Battle on the Bank game three years ago during Edition VI in Los Angeles was, by our tally, the absolute worst blowout (in a 30 min. half-game) in the modern history of interleague banked track roller derby. Final: San Diego 214, Penn Jersey 4. PJRD got their points on the very last (reg) jam of the game. Crowd went nuts, and deservedly so. From those very humble beginnings, Penn-Jersey is now starting to flirt with becoming a regular winner in the RDCL. A winning start to their season is great, but to really cement their place, they ultimately need to get that first Battle on the Bank win. In the world of banked track roller derby, the L.A. Derby Dolls are still king. (Queen?) Last year the iconic organization finally settled in to their new home and hit the ground running after leaving their old one behind, playing a 12-game home season in just six months. That stretch included an interleague game against the Minnesota Rollergirls in July, where L.A.’s all-stars easily beat them 264-94. This month has been particularly busy for the Dolls. They first played against The Rejects, who made an appearance at Jantastic in San Diego a few weeks ago. The pickup team was without Demanda Riot, who is still recovering from a gnarly ankle injury she suffered in San Diego. L.A. took that game 217-120. This past weekend, LADD brought back its popular March Radness bitraxual training camp. The highlight of the four-day camp1 is the special exhibition bout that makes teams out of the elite coaches, L.A.’s local players, and some of the best campers. This is by far our favorite game of the year. And why wouldn’t it be, when there’s a lobster food truck outside, Quadzilla throwing trucker hats to the crowd on the inside—and oh-by-the-way, players of this caliber roller skating on the banked track along side skaters like you? The pink-black game ended 173-139 in favor of the winning team: everybody. At the end of month, LADD will make a rare flat track field trip to Denver to take on Rocky Mountain’s B-team, the Contenders. L.A. and Rocky have played each other in years’ past on the banked track, with their last meeting happening in 2011 at the Pro Roller Derby Invitational in Chicago. L.A. took that game—and a $10,000 winner’s check—with a last-jam victory. The last time the LADD all-stars played in a WFTDA-rules game was in March 2014, when they got pounded 349-40 by Rose City in Portland. The dates for the RDCL national tournament are set. On the weekend of June 3-5, the best banked track teams in the country will converge on Philadelphia, Penn. for Battle on the Bank IX , the first time the event will take place on the east coast of the United States. This is a really big deal for the banked track coalition. Before BotBIX host Penn-Jersey Roller Derby switched to RDCL (and MRDA) play three years ago, the RDCL had no membership past the deserts of Arizona. The banked track in Philly, which has been up and stable since 2010, was pretty much the only one east of the Mississippi River. But in the past 12 months, Penn-Jersey became full RDCL members, Deadly Rival has set up their track in Florida and are already playing interleague games, and there is suddenly a lot more potential and actual banked tracks appearing their way. PJRD themselves had gone through a successful crowdfunding round to “renovate skatin’s hellhole” in preparation for IX. Penn-Jersey and the RDCL are hopeful there will be a full field of eight participants at the tournament, though only seven teams have been confirmed at this point. Joining the hosts are the usual suspects—L.A., San Diego, Tilted Thunder, and Arizona—plus TXRD of Austin and South Side of Houston. Referees or officials interested in working the event can apply here; applications will be accepted through March 27. Roller Derby Notes will be in Philadelphia for Battle on the Bank weekend. Check back in June for a full event preview and updates from ground. Now for an update with what’s going down with banked tracks being built up and coming down. The biggest story of late was that of OC Roller Derby, one of the founding members of the RDCL. After they lost the lease to their (gorgeous) warehouse space at the end of last year, they gave up the ghost last month, announcing that their banked track was for sale. With no banked track to compete on, OCRD’s future in banked track competition is uncertain but likely kaput; the team will not be at Battle on the Bank this year. They have always been a flat/banked hybrid organization, however, so a move to a flat-only league looks to be in the cards. Though the loss of another one of SoCal’s tracks is a tough blow—at one point there were four or five active around the area, but now there are only two (L.A. and San Diego)—the amount of banked track activity around the rest of the country is making up for that loss quite nicely. The Texas Outlaws Roller Derby of Alvin, Texas, a suburb of Houston (and neighbors to South Side Roller Derby) are currently in the final stages of erecting their new banked track, as seen below. It’s an older style track, but it’s a banked track all the same. This addition marks the fifth active banked track in the Lone Star State, joining TXRD, South Side, San Angelo, and Sun City in El Paso. It should be noted that although TXRD and South Side have been regular participants at Battle on the Bank, no team from Texas is a member of the RDCL at this moment in time. As the banked community in Texas continues to grow, we wonder if that will soon change. Back in California, the Bay Area Black Widows, the new banked track league out of the San Francisco area, are gearing up for their first season. Though they have a track, the league is still looking for a location to set up shop. This hasn’t dampened their recruiting efforts, though. The Widows already have enough players to form two full teams, plus the core of a men’s team, which would be the first real men’s banked track team in modern roller derby. Like Deadly Rival, the Black Widows aren’t waiting to get playing. They’ll be in their first banked track interleague game on April 23 in San Diego against the Sparks, the SD B-team that also played at Spring Fling earlier this month. That game will be a nice gauge to see where the new kids on the banked block stack up against the RDCL establishment. Lastly, we’ve picked up on a new push for banked track roller derby in the state of Michigan. Hell Ocho, a former member of the L.A. Derby Dolls track monkeys crew and current Michigan resident, has recently acquired a banked track—specifically, this banked track. We understand the plans for the track are a little complicated, in that there will initially be no home base for it. Ocho tells Roller Derby Notes that he would like to tour the track around the state this year to drum up interest, then settle down into a permanent location in 2017 with the ultimate intention of creating a league to join the RDCL. We’re still waiting for more information about the track’s immediate plans, though, and when we have some we’ll pass it along. If you include RollerCon’s track, which will be back in action in Las Vegas this summer, we can count at least a dozen tracks that are active or are on the verge of being so. There are still quite a few tracks for sale or sitting in mothballs at the moment, but if the RDCL and the greater banked community can keep this momentum up, it may soon become a buyer’s market. To wrap up this round of Banked Track Notes, let’s talk a bit more about the special event happening in Santa Monica, Calif. this upcoming weekend. Roller Expo 2016, anchored by the Rollergames World Series exhibition games between the USA and Japan in the Japanese power-jam-only style of roller derby, played on a banked track. This will be a high profile, very public event for roller derby, staged right on the beach next to Santa Monica’s iconic pier. Three players from each squad come from modern roller derby, with the rest comprised of the legends and professionals of a parallel derby universe. (Weber and Blitsch were also participants on the Rollerjam TV show in 2000.) As we reported a few weeks ago, mixing the two eras together has created some tension, but the modern players we’ve been able to talk to ahead of the event are game enough to give this thing a go. Though the previous incarnation of this event in the early 1990s had skaters playing in a very much full-contact game, the modern version of it, at least when played on the flat track, actually resembles something more like the speedy-physical play you might see in USARS…just with a lot more whips. As you can see from this highlight from a recent game played in Japan. So it’s obviously a different style of derby, but still one that is quite literally foreign to just about everyone in the roller derby community. We’ll be very interested to see how the modern skaters, on both the men’s and women’s sides, react to the Japanese game and the event itself, particularly if they would have any further interest in participating in any potential future events. Team Japan has already arrived in Los Angeles, and will be spending the week training for their debut. Team USA should all get together by Friday, for one final training session Friday night before taking to the banked track on the beach for two full five-set games, one each on Saturday and Sunday. Roller Derby Notes will of course be in Santa Monica all weekend to report on everything happening during Roller Expo 2016, including what the skaters think, what the fans think…and what we think. 11 weeks until BOTB and they STILL haven’t changed the website. #TellTaleSign? Besides the karaoke afterparty, I mean.